In October the Supreme Court will begin deliberations on a ruling that could change the toxic environment of our politics. In the much-anticipated case of Whitford vs. Gill, the court will review the redistricting plan of Wisconsin, which a panel of three federal judges ruled was unconstitutional. The Supreme Court’s decision in this case could shape American elections for better or worse for decades to come. Justice Ginsburg has stated that she expects this to be the most important case the court will hear this term, and Justice Kennedy may have postponed his retirement in part in order to participate in this ruling. States redraw their voting districts every 10 years following the national census to accommodate changes in population. Wisconsin’s redistricting is a classic case of gerrymandering, the practice where a majority party draws district boundaries to obtain an advantage in future elections. 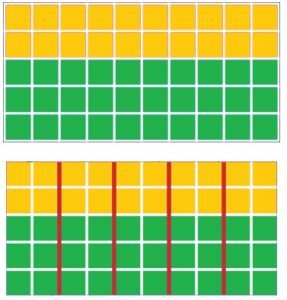 The gerrymandering technique of “packing and cracking” is best seen using some simple maps. Below is a state with 5 representatives in Congress. Each representative is elected by voters in 5 districts. Redistricting will define the boundaries of these 5 districts, which is each made up of 10 precincts. Voters are expected to favor the green party in most precincts, but the gold party was in the majority in the state legislature and performed the last redistricting. By drawing the 5 new boundaries so that green voters are packed into the bottom 2 districts and are spread out in the remaining 3 districts, the gold party can elect 3 of the 5 representatives, even though they will only receive 40% of the total vote. A characteristic of gerrymandered districts is how they are twisted and spread out. The victims of partisan redistricting often point to this tortured geography as evidence that they have been gerrymandered, and such districts can certainly look preposterous. Below are two maps of North Carolina’s 12th district from before and after a federal court rejected the Republican version because of its racial bias. The rejected map is on the left, and the unbiased map is on the right. Here the green party controlled the legislature when redistricting was performed. All the districts are as compact as can be, but the green party will win all 5 of them. Although the gold party has 40% of the vote, its voters are left with no representation. So if compactness alone is not a reliable standard, how can courts decide if gerrymandering has occurred? The problem is especially hard because , and this is how Wisconsin’s Republicans defend their plan, Democrats essentially gerrymander themselves unintentionally because they are clustered in urban areas. Assume, for example, that the gold precincts above represent cities where Democrats are in the majority and the green areas are the Republican suburbs. A logical redistricting plan still results in the same lack of representation for the gold (Democratic) voters. Compactness is only the fifth out of six of the criteria used by the bi-partisan California Citizens Redistricting Commission, and this is similar for other bi-partisan and non-partisan redistricting commissions. Compactness must not conflict with the higher-ranked criteria that include compliance with the Voting Rights Act. 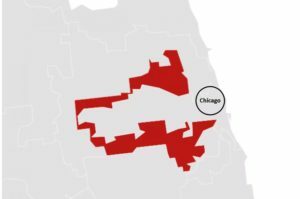 Here is Illinois’ 4th congressional district. The northern and southern halves are connected by the median strip of Interstate 294, where nobody lives, let alone votes. The district joins two majority Hispanic areas into one. While it may appear that this was done to pack Democratic voters together, the surrounding areas are also largely Democratic , so it can be argued that this strange looking map was drawn only for the laudable purpose of ensuring Hispanic representation in Congress. But the Democratic candidate for the 4th district ran unopposed in the 2016 election. The perpetrators of gerrymandering rely on this complexity to disguise its presence. But still, lack of compactness is a clue. Consider the evolution of Pennsylvania’s 7th congressional district over the years. 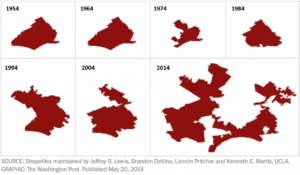 The figure below shows how the district changed over the last several decades as the Republican party gradually gained control of the state government and changed this battleground district into a safe seat for their party. This Pennsylvania redistricting plan was the subject of an important Supreme Court ruling in 2004 that may be crucial for the Whitford vs. Gill Wisconsin case. In spite of the obvious gerrymandering in Pennsylvania, Justices Scalia, Rehnquist, Clarence Thomas and Sandra Day O’Connor were of the opinion that the Constitution gives state lawmakers the power to draw districts. While this may be a flaw in the design of our government, it is the role of the legislative branch and not, according to these justices, the role of the courts to fix it. On the other hand, while Justice Kennedy voted with the four conservatives and against the Pennsylvania voters, he did so because he wrote that no reliable standard existed for determining if redistricting was done on the basis of partisanship. wasted votes by the opposition and minimizes its own, and so it results in a large efficiency gap. Will the Supreme Court use the Efficiency Gap put a stop to gerrymandering? They may have more than one opportunity to do so this term. In addition to Whitford vs. Gill, a second case appears destined for the Court. This suit is brought by Republicans against the redistricting maps drawn by the Democratically-controlled Maryland legislature. This case illustrates two issues: 1) neither party is above using this tactic, although the Republican Party seems to have perfected it, and 2) gerrymandering, again, is hard to measure. Point #2 comes about because it appears that the Democrats would have achieved the same election results even if they had not gerrymandered, which they admit they did (the Democrat’s defense is that the court has never ruled against it). measures had not been enacted starting in 2010, the outcome of the recent presidential election could easily have been different. Previous Previous post: Should Felons be Allowed to Vote? Next Next post: Why is the NVC Non-Partisan?